I've taken a bit of an unplanned break from blogging since my last post but I just had to do a quick post on one of the latest additions to my nail varnish collection. 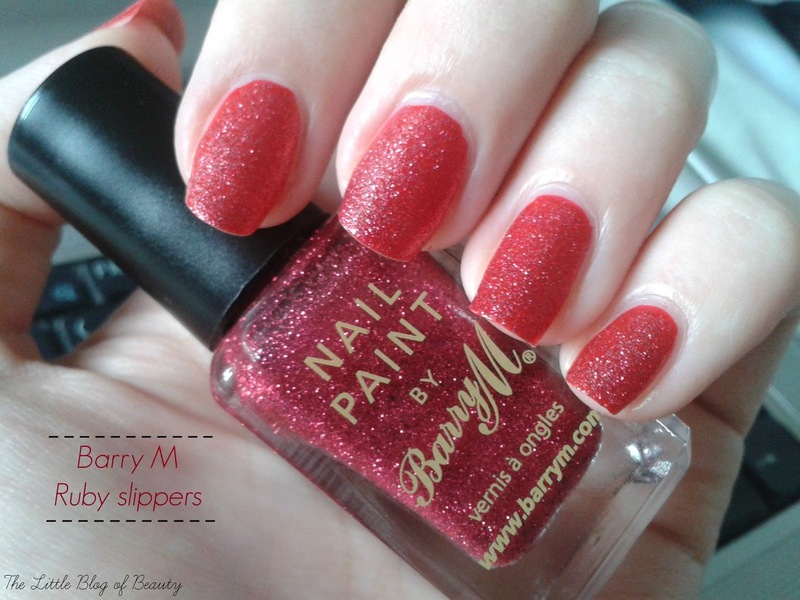 After many years avoiding it (more on that in a second) I've decided to embrace glitter nail varnishes again and a few days ago I picked up Barry M's Ruby slippers. This is much more ruby coloured than my picture shows (sorry about that, it looked better on my phone screen but doesn't transfer to computer screen) but take my word for it this is a gorgeous, glittery, ruby/cherry red that is absolutely perfect for this time of year. I've completely fallen in love with it. If you check the image on the Superdrug website this will give you a much better idea of the correct colour. Although this is a full coverage kind of glitter I think it's always better to use a base in a similar colour to give it a little support, or a different colour if that's the sort of look you want to go for. My boyfriend seems determined to make me try some of Poundland's new makeup range and has bought me a couple of their nails varnishes. One of them was a lovely red, just slightly orange shade called Pillar box red, which is what I've used as a base for this. The reason I bought Ruby slippers is a few days ago I picked up NYC's peel off base coat from Superdrug, so I could start wearing glitter nail varnishes like this. I'll be posting a full review of the base coat in the future but so far I'm thinking it's pretty amazing and may just have changed my life! A little excessive? Maybe just a little! Although this involves three different nail varnishes it's actually a complete bargain. The NYC Strip me off base coat is just £2.99, the Poundland nail varnish is obviously just £1 and Barry M Ruby slippers is £2.99, so the whole thing comes in at just under £7. If you still need to get into town this week for some last minute Christmas shopping I'd recommend picking up each of these little beauties for perfect, cheap, quick and easy to remove Christmas day nails. What will you be wearing on your nails for Christmas day? I currently have this on my nails, such a lovely glitter! Ooh this shade is stunning, I'm really intrigued by the peel off base coat too so will look forward to reading your review :) This year I'm cheating & wearing some pre-designed Christmas false nails. I love this polish! I've been layering it over the Silk Effects polish in Poppy and it looks amazing!